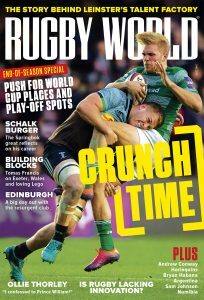 The latest issue of Rugby World celebrates England’s Six Nations Grand Slam triumph, as well as that of Wales U20, and looks at where all six countries stand ahead of the summer tours. On top of that expert analysis, we have exclusive interviews with the likes of George Kruis, Rhys Webb, John Barclay and Andrew Trimble. Plus, as the Olympics near ever closer, we meet a player chasing glory with Brazil and get the lowdown on the Vancouver Sevens. Stephen Jones lays out his plan to make rugby safer, Nick Evans looks at the different skill levels between the northern and southern hemisphere, and we chart Richmond’s rise back to the upper echelons of English rugby. Champions Cup – Who stood out in the stats stakes during the European pool stages?